It’s probably hard to grasp the importance of a cookie that is better than a Scout cookie if you’ve never had, let alone heard of, a Scout cookie. So, let me take a step back. One of my best friends lives in Denver, and in addition to the pleasure of getting to spend time with her, my second-favorite reason to visit Denver is Watercourse, an unassuming restaurant that serves, by far, the best vegan food you’ve ever had in your life. It’s not crunchy-granola vegan; it’s more like amazingly delicious and creative food that just so happens to be vegan too. They also have an extensive menu of gluten-free options. Bottom line: it’s a spectacular restaurant that I have been known to eat at twice in 24 hours. With all of the wonderful food in Denver, a place that merits two meals almost in a row is really saying something. But, while you can’t go wrong with anything you eat at Watercourse, the best thing that comes out of their kitchen is the Scout Cookie. 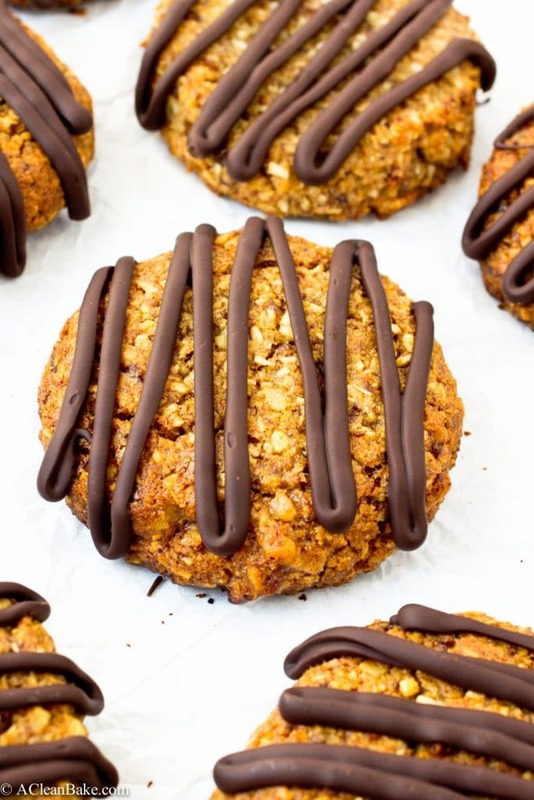 It’s basically a grown up version of the beloved Girl Scout samoa cookie: dense and chewy, flavored with coconut and caramel and topped with a generous drizzle of chocolate. Theirs is dunked in chocolate too for, you know, authenticity. And chocolate. It will blow your mind. The thing about these cookies is that they are hidden in the pastry case at the front of the restaurant, which you walk past to get to the hostess station. And with your eye on the prize (the prize = a table/dinner), you’re likely to miss these beautiful cookies altogether, or worse, bypass them in favor of something else. They may not look like much – flat, brown, and vaguely healthy-looking amongst the sea of fluffy cinnamon rolls and golden-edged chocolate chip cookies – but once you try one, you can never go back. The recipe for these beloved cookies, apparently, is a closely guarded secret because it is impossible to find online. It simply doesn’t exist. There are a few copycat recipes, but they use sweet potato and, well, no thanks. Nothing was quite right so I had to start from scratch. First things first: a generous helping of coconut which, per the original Scout, but not the original Samoa, is inside the cookie, but not atop it. Then there’s the question of caramel, a flavor which is achieved by the medjool dates. They have the same deep, dark sweetness as caramel without all the refined sugar. 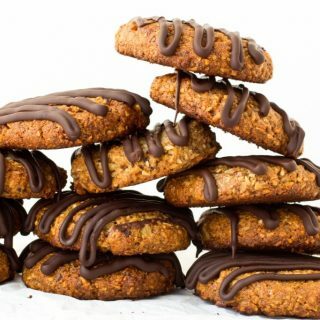 The cookies have a little crunch from finely chopped walnuts, a depth of flavor from some added cinnamon and – of course – a fat drizzle on chocolate to finish. Since my only complaint about the original cookies is their excessive sweetness, I dialed it back by reducing the overall amount of sweetener in the recipe and skipping the chocolate layer on the bottom. Feel free to add it back if you want to! Either way, you can’t go wrong. 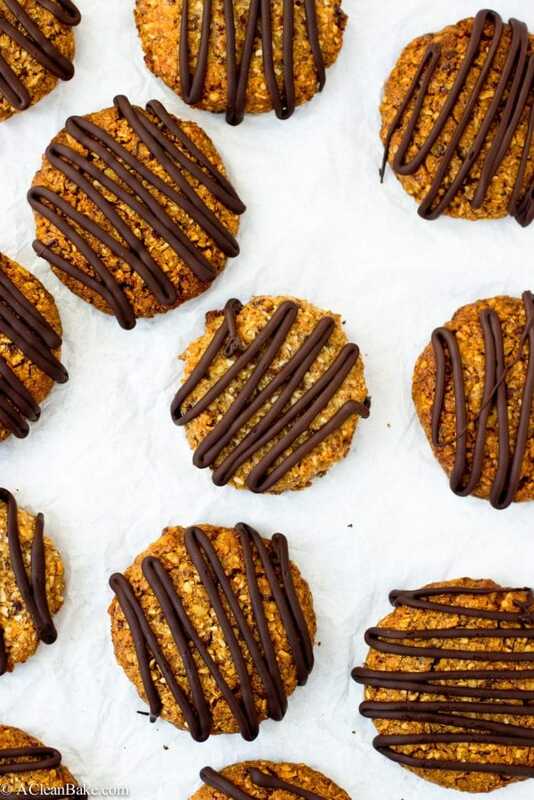 From your first bite, you’ll be a Scout-cookie convert, and you may or may not dream about them. 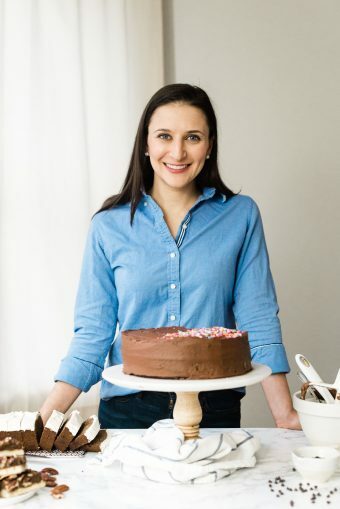 PS: While your BTSs (Better-Than-Scouts) are baking, head over to PaleOMG where I am sharing this recipe today! Preheat the oven to 350F. Line a cookie sheet with a nonstick pad or parchment paper. In the bowl of a food processor fitted with the S blade, pulse the walnuts 7-10 times until they are finely chopped. Transfer the chopped walnuts to a large mixing bowl and stir together with almond flour, coconut, flax, cinnamon, baking soda, and salt. Set aside. In the bowl of the food processor, combine the dates, egg, honey, vanilla and butter or oil. Process until smooth. If you still see flecks of date, that’s ok, but make sure there are no large chunks left. Pour the wet (food processor) mixture into the dry mixture that you set aside and stir to thoroughly combine. Use an ice cream scoop to portion the dough into 4-tablespoon mounds. Use your palm to gently flatten the top into a thick disc. Place the cookies 2” apart on the prepared baking sheet. Bake for 16-20 minutes (mine took exactly 18) until golden brown. Cool on the sheet for 5 minutes before transferring to a wire rack to cool completely. 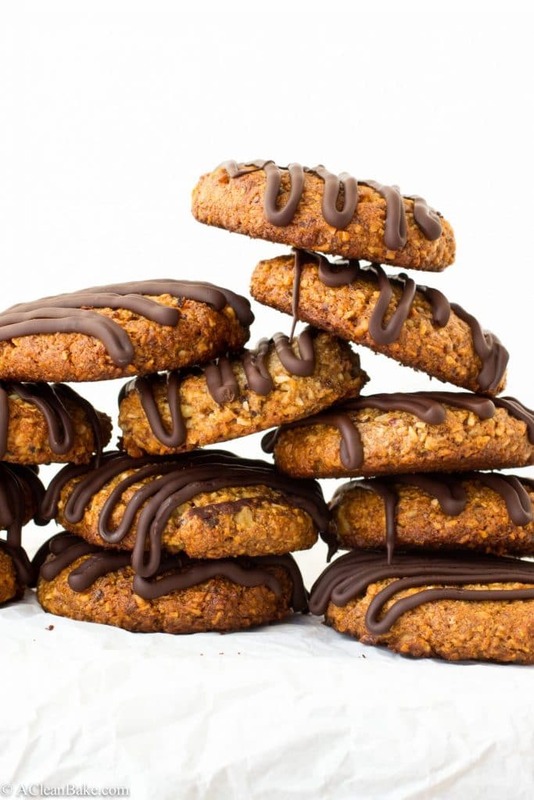 Once the cookies are cooled, drizzle the melted chocolate over the cookies. The easiest way to do this is to pour the melted chocolate into a small zip top bag, seal it, and snip the corner off of the bag so that you can use it as a piping bag. Allow the chocolate to set before serving. Vegan adaptation: Replace the egg with a flax egg or other vegan egg replacement and the honey with agave. You could also replace it with maple syrup but the batter might be a little runny. Store in an airtight container at room temperature for up to a week or in the freezer for up to 3 months. Um… yes!! I’ve only recently learned of City O City, but it’s def on my list of places to visit in Denver next time I’m in down. Watercourse is amazing though. The other dont-miss item is their waffle fries. And their tacos. Oh and … ok suffice it to say you can’t go wrong! Man I need to plan another trip out your way…. I love all vegan restaurants! 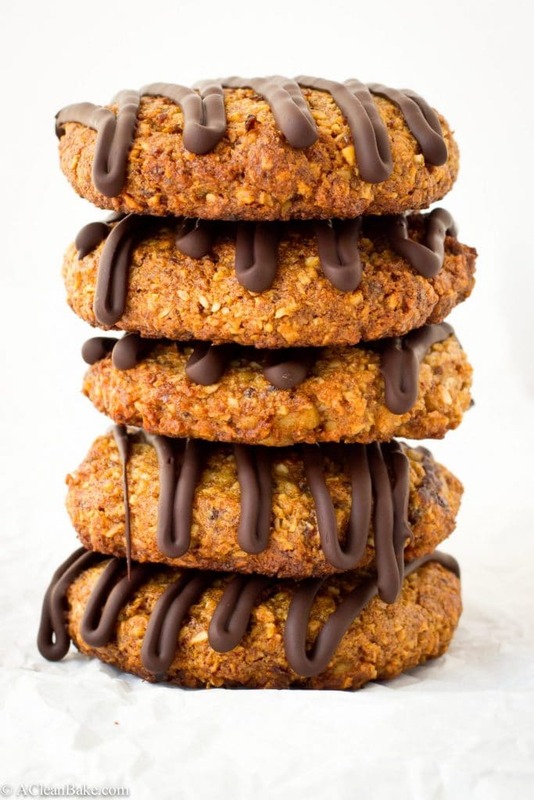 I just went to a great one in Connecticut and I loved the freedom of being able to order anything off of the menu without having to ask for specifications 🙂 These cookies look amazing and I have GOT to get over to this restaurant! Isn’t it great! I used to be a vegetarian and felt the same way about veggie restaurants. It was such a treat to have more than 2 menu options, let alone the entire menu! (Now, given all my dietary restrictions, I’m back to 2 sadly). This restaurant (and these cookies) are a total can’t-miss!! Thanks, Allie! I’m glad you said it – they ARE better than the originals (if I do say so myself). And that’s saying something, given how addictive the originals are! Okay, made these yesterday and I’ll have to make another batch tomorrow. My husband was out of control! These are really good and I like how hearty they are and how they’re not too sweet. Thanks for your creativity. Thanks for this excellent recipe! My fiance and I are trying our best to make them last more than 36 hours. 🙂 They are less sweet than a normal cookie, which we both think is perfect. I didn’t feel like using a ziplock so just plopped the chocolate on with a spoon. Not as pretty as yours, but just as tasty! You’re welcome, Colleen! They definitely don’t have the same sweetness as a normal cookie, but I’m glad you and your fiancee like it that way (I do too). Smothering them with chocolate sounds like an amazing idea! I love going to restaurants that cater specifically to a certain lifestyle.. so interesting! These cookies look delicious. Nora, you evil genius. I’m pretty sure I bookmarked this back in the day because these GORGEOUS, FLAWLESS pictures look awfully familiar…but now its all the better because I’ve been to Denver and experienced the hype!!!! We went back twice in two days and both times got the insane chicken fried cauliflower. Omg. Still dreaming about it. And I passed up the Scout cookies both times!!! Rookie mistake. Although at like $6 a pop, they are not cheap!! Can’t wait to try your version!!! Excuse me while I go legally change my name to NoraYouEvilGenius! Haha. I think I remember you commenting on these when they first appeared on PaleOMG, but I can’t blame you for not fully appreciating them until you went to Denver (I was the same way). Honestly, if you ask me the homemade version is even better than the $6 ones! And not least of all because you can EAT THE WHOLE BATCH. Not that I’m speaking from experience. Maybe.